Last minute, we decided the illustrator should go to a convention in Chicago. I hope it is a good trip for him!!! Work it honey! I swear nobody works harder than that man! So, this leaves me solo...well, I am with the boys. We got up at 4am and got him to the airport on time! When I finally got home, I started baking. I know, sounds crazy, but I needed to do something with myself and I promised I would bake the boys something today. I know I will start to drag later, so, since I had the energy then (totally coffee induced), I got busy. Like Jessica said...when I bake, I forget to eat. I guess I was focused on baking since I was so tired. I finally got around to eating around 9am. I normally make oatmeal for the illustrator and myself, but today...it was just me. I went super simple with apple, cinnamon, flax and almond milk. I love this combination. The flax and cinnamon work really well together. They seem to enhance the flavor of each other and the oatmeal too! 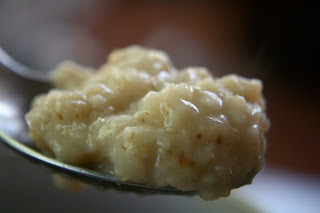 It also gives the oatmeal a thick creamy consistency. LOVE it! 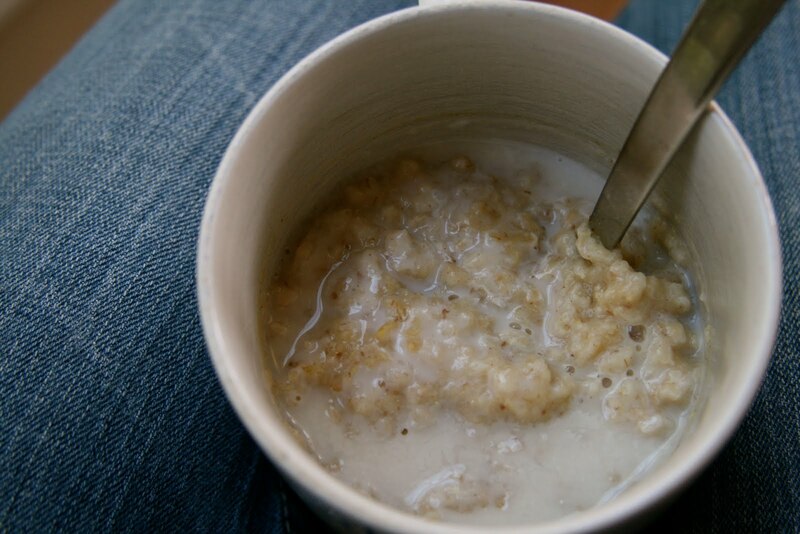 I enjoyed my mug-o-oatmeal sitting next to the sunshiny window and a hot cup of joe. I am off to finish the cookies...the boys are anxiously awaiting...shortbread, peanut butter and chocolate...I can't blame them! Ha! I wish I would forget to eat when I baked! I don't twitter...I feel like between blogging and facebook, I spend enough time on the internet!! Twitter would be one distraction too many! That being said, I know lots of people do love it! Ironically, baking and cooking are what make me the least hungry. It's good to have food as a distraction but not feeling compelled to eat it. I use twitter mostly for procrastination, but it's also helpful to ask a quick question and get a response or make friends. I twitter. I do it because people ask me what I eat all the time. I post regularly what I'm snackin' on and then have the twitter feed posted on my blog. Ya' know, pushing the belief that the healthy lifestyle isn't so hard. :) It's neat cos it work as a good food diary too. ahhh I really wish I had my own kitchen so I could bake all day! Seriously, it's fun haha. I've just started to Twitter and getting the hang of it. I use it as a quick check in and for stuff I don't want all of Facebook to know. I have a Twitter account and I love it. I was against it for so long but now I am of course addicted! haha! hmm, the oatmeal sounds good ... but where can I get some of those cookies too! Just catching up on your posts - you are too much fun, love the corndog muffins! I hope your solo time is going well. I do twitter, but aside from a feed, I really hadn't figured out how to use it well ... thanks for the idea on the foodie log farty girl (and seriously funny name! ).